Left Coast Rebel: Have you heard of Herman Cain? Have you heard of Herman Cain? If you haven't, it's time to get educated. The great truth that every Republican presidential candidate must accept is that tonight – and every night, until November 2012 – they dine in hell. They will do battle with an incumbent who presents his re-election as a moral imperative, supported by a media culture of suicidal liberalism that does not want to be told America can no longer afford its appetites. They must relish uneven playing fields, nervous voters, and the difficult process of fusing emotion and reason into inspiration. The ideal candidate must understand that America’s greatest days lie ahead of her… on the far side of the most perilous hours she has faced in a century. They are battling for executive power over a system that will fight like mad to defeat them, and die of complications from its victory. They will represent an electorate that is tired of apologizing for capitalism to people who want to kill it. Herman Cain seemed to fit that description best on Thursday night. He’ll face some different opponents in his next debate. The smart ones will watch the tapes from South Carolina, and be ready for him. CBS: "Herman Cain makes splash at first 2012 GOP debate"
Larry Kudlow tweets: "Herman Cain wins GOP debate in S.Carolina hands down... Problem-solver." Gateway Pundit: "Herman Cain Is BIG WINNER at First GOP Debate"
John Hayward: "...the most commanding orator of the group," "supreme confidence"
Lucianne: "Frank Luntz was blown away about the overwhelming support Mr. Cain received after the debate." Jill Victoria: "Wow! 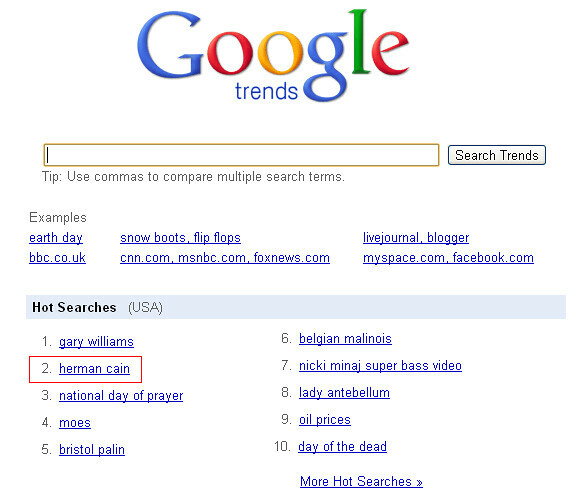 So proud and impressed that Herman Cain is trending worldwide!" Erick Erickson: "...Cain dominated. He went from being unknown to a household name." Sam Foster called it early. 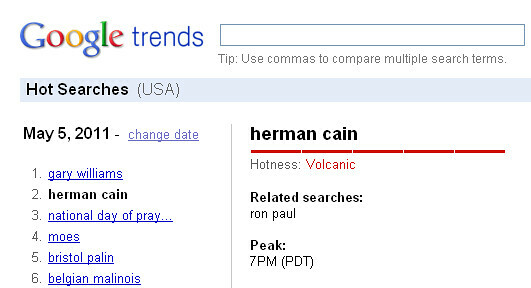 Update: Google Bomb... Herman Cain is so hot, he's VOLCANIC! Ron Paul is the only one spelling out what needs to be done. "Herman Cain wins GOP debate in S.Carolina hands down.